I've been wanting to try this product for a while and I got this for Christmas as a gift from my roommate when we did Secret Santa. 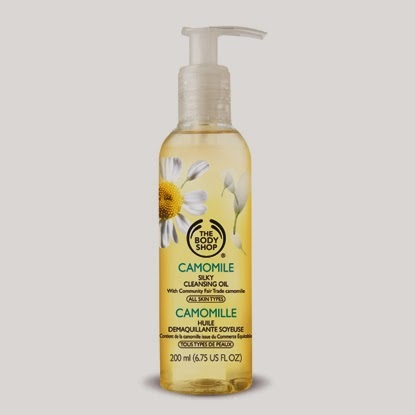 I've tried the Sephora cleansing water which is really awesome but I wanted to try this one because I love the Camomile line from The Body Shop. It comes in the size of 200ml and it sells for $16 CAD but The Body Shop during Christmas always has amazing deals so definitely look into it. This silky-soft cleanser will effortlessly remove make-up from the whole face quickly and effectively, leaving skin feeling clean, refreshed and clear of impurities. It’s the ultimate time-saver. The packaging is adorable and I love the scent of the product. I usually use 1-2 pumps on my hands and rub it onto my DRY face. It's very thick which it should be because it's called an oil and not a water like the Sephora brand. I typically rub it in for around a minute and even use it over my eyes just make sure you do not get any in your eye. If you're sensitive I might even suggest using eye makeup remover instead of the oil on your eye because it is thicker and it really hurts if you get it in your eye. After I feel like my skins coated in the oil I add water to let it foam off and then I rinse. It gets off I would say 80-90% of my makeup but I always wash with a cleanser afterwards so for me that's not a big deal. I wouldn't suggest using this product as you're only cleanser. I see it as more of a makeup remover for your face and then you cleanse to remove any leftover product. I always use a toner after as well which further removes any leftover product and balances out your skin. This hasn't broken me out and I have incredibly sensitive acne prone skin. I've been it for about 5 days every night and my skin always reacts right away, so since I haven't broken out I definitely won't. Overall, I really like this product as a makeup remover and I'm so glad I got this because I hated always buying makeup wipes and putting more garbage into the environment by using them. This is a really good alternative to cleansing makeup removing wipes! I just bought an Origins cleansing oil and had an awful experience! Maybe I'll give this one a go!